Let me open this edition of the web site's main page with a comment. Quite often I receive e-mails from new Anchor Friends (AVs) about the "errors" in Richter's plans. Invariably, the error is in their construction of the building, not in the design itself. Now, that does not mean there are no errors in any of Richter's plans. There are! But for some reason these errors are never mentioned. There are also errors in the packing plans for sets. If one buys a # 34, Lyck, packed according to the packing plan supplied with that set, does he have the same stone inventory he would have if he bought set # 6 and all of the supplement sets up through # 32B? No! How many stones are in a set # 34, Lyck? 3,848 or 3,851? Or are they both correct? I will not give the answers to these and other Anchor "mysteries" here. AV Bruckmann (Wien, Austria) has examined the conversion sets from the AF (alte Folge; old series) to the NF (neue Folge; new series). He found that in several cases the stone counts published in Richter's catalogs are not correct. Hey, how hard could it be to count the number of stones in a relatively small, one or two layer, set? I know from bitter experience; a lot harder than I thought it would be. For the CVA Stone Catalog, AV Leo Coffeng, the original editor, ended up requiring packing plans, not just stone counts, even though only the stone counts were going to be published. And he had the stones counted several times by multiple workers. Counting was made easier through the use of multiple color copies of each packing plan, which allowed the counters to mark off each stone as it was counted. 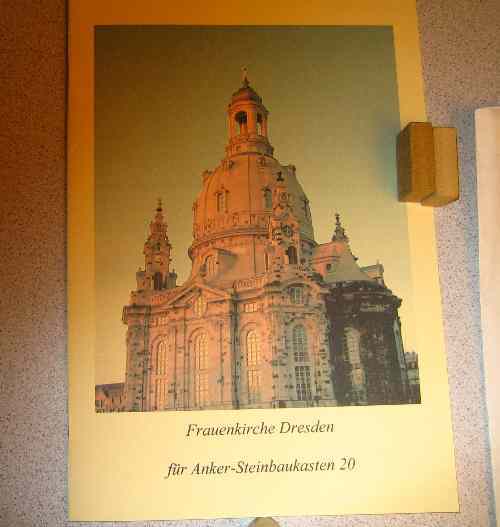 On the builder's page you will find a model of the Frauenkirche in Dresden. Falk Gundel (Dresden, Germany) designed it for the Anchor set NF 20, as sold by the new Anchor factory in Rudolstadt, Germany. The design requires the substitution of eight 181G for four 179G columns. And as you can see above, he drew up the plans. The booklet containing these plans is available from the new Anchor factory in Rudolstadt, Germany. I do not have an inventory of these booklets. He has also designed other versions of this church -- for sets NF 16 and NF 26. The NF 26 version is available on the Internet at www.ankerstein.ch. There is a special exhibition (Sonderausstellung) near Vienna (at the Stadtmuseum of Traiskirchen, Austria). This exhibition runs from March 17, 2006 until December 24, 2006. More than nine months! And not only six months are left! There is no excuse to miss it! The web site is www.traiskirchen.gv.at, And Vienna is a wonderful city -- well worth a visit even without a special Anker exhibition. I plan to visit the exhibition this fall. I have started to plan the trip. I think I will bypass the music and drive through Nieder and Ober Austria. The Phaidon Cultural Guide to Austria indicates that there are many interesting castles in this part of the country, and they are in the general direction of Rudolstadt. The long awaited set 24A is now available in the USA. I have all sets (through 24A) in stock. The 26A was not shown at the CVA meeting on April 22nd. Two new sets will not available at retail -- either here or in Europe. They can be purchased at the factory only. I have bought some more mosaic sets and am in the process of bringing them home for sale in the USA. I brought home three of each in May. They were sold within days of my return. Once more, in late October, I intend to bring home two sets of each type. I think I will stop this "project" with these last four sets. My carry-on bag is suffering from damage due to the weight of Anchor sets. Pricing and availability information is found on the new sets page. I have received a notice that there is another price increase. The factory has raised prices to the US importer and the value of the US$ against the Euro has been falling. I may have to review my prices, but I have not made any changes as yet. The prices on this web site are the same as they were when sets were first offered about ten years ago. Send me an e-mail if you want a set. CD-ROM Archive: I can supply the CD-ROMs of the CVA's CD-Archive. More scans are being added all of the time, and the "holes" in the documentation are being filled. Of course, more scans means more CDs, and as scans are added some files are moved to another CD. As of today, there are sixteen (16) CD-ROMs in the Archive, plus, for CVA members only, 8 additional CD-ROMs of the old MLBs (including an overview CD-ROM) and 3 CD-ROMs of the AHN (including an overview CD-ROM). (Do not try to buy these MLB CD-ROMs unless you are a CVA member. I check the membership list!) All of the scans are JPG files. # 1 (unchanged) contains the GK-NF building and layer plans, excluding # 34, the Anchor book in PDF format in English, plus odd things like box covers, figures, insets, rulers, etc. ; # 2 contains the DS and # 34 building and layer plans; # 3 contains all packing plans, exhibition buildings, building plans for Imperator (1st Series); # 4 (unchanged) contains the building and layer plans for the second series of GK-Br and Imperator, the VE series; # 5 contains the KK-NF and KK-Br building and layer plans, plus Comet, Erste Folge, Orion, Eagle, Imperator (all metal), advertisements, Richter, Rudolstadt, CVA Stone Catalog; # 5A KK-AF building and layer plans, price lists, book (PDF -- German and English); # 6 contains documentation including my book in both English and German and various magazines (like the Anker Zeitung) and magazine articles; # 7 contains the building and layer plans for the series 100 (Neue Reihe), 200 (Modern [American] House Series), 300 (Landhaus [Country House] sets), 400 (Festungs- und Burgen-Baukasten [fortress and castle sets]), NS, Capital, Täfelchenlegen, Mosaic sets, games, VEB, LaVelle, KMBK (Art Model Building Sets), Eisenbrücken, A-B (American Bridges); # 8 contains the building and layer plans for the series GK-AF, the first series of GK-Br; # 9 Catalogs, # 10 Personal Designs; # 10A Eigenentwürfe; # 10B more Personal Designs (they won't fit on two CDs now), factory, Sonderkasten (special sets); # 11 Movies, web site and web site index; # 12 an overview using PDF and other more modern PC programs and formats, and # 13 additional overview (it won't fit on one CD now) and the web site. Only the members of the Club of Anchor Friends are permitted to purchase the eight CD-ROMs containing all of the MLBs (up through Winter of 2005), including both the English and the German language translations and an overview CD. CDs of the AHN have been added to the Archive. The AHN needs two CDs, plus a third CD for the overview. If you want to buy one or more of these CD-ROMs, please send $2 (or euros, your choice) for the first CD-ROM and $1 each for the rest -- postage included, no matter where they are going. The Euro payments should be sent to the CVA in the usual way that you use. CDs are inexpensive, so I do not see a problem if, at this stage of the Archive, some CDs may become obsolete due to the relocation of files or the addition of more data. The new Anchor factory in Rudolstadt, Germany has added many new designs to its web site (thanks to the help of Burkhard Schulz). They can be easily downloaded, as they are PDF files. For the month of July, 2006.